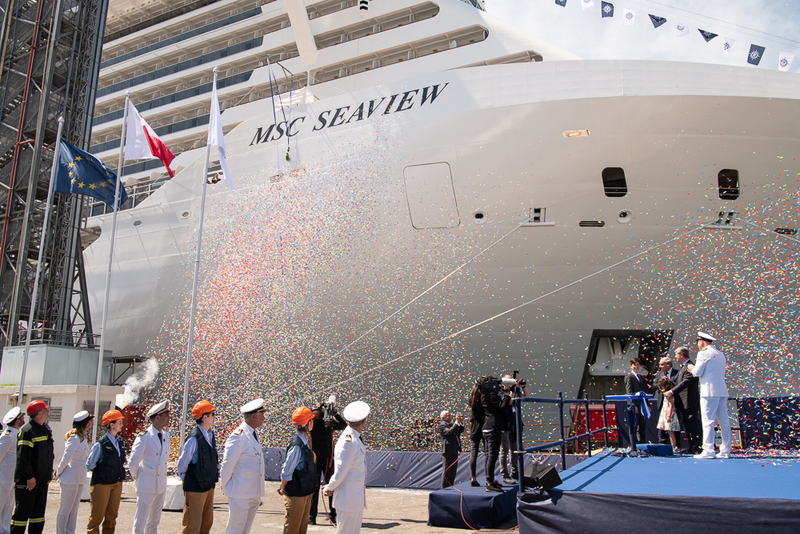 Monfalcone, Italy, 4 June 2018 – Today at the Fincantieri shipyard in Monfalcone, Italy, MSC Cruises officially took delivery of its new flagship MSC Seaview. The delivery ceremony took place in the presence of Gianluigi Aponte, the shipowner as well as Founder and Executive Chairman of MSC Group. Also present at the ceremony were Pierfrancesco Vago, Executive Chairman of MSC Cruises, other members of the Aponte and Aponte-Vago families, Giuseppe Bono, CEO of Fincantieri, as well as other regional and local authorities and dignitaries. Hot on the heels of MSC Seaside coming into service at the end of 2017, MSC Seaview is ready to start sailing her inaugural season in the Mediterranean. The ship represents a key highlight for 2018 as she is the one MSC Cruises new-build coming into service this year, the second ship to be built by Fincantieri, the third ship to be completed in just 12 months, and the 15th ship to join the MSC Cruises global fleet. The ship with her iconic design and generous outdoor public spaces will be a game changer for guests who want to make the most of the sun and outdoors, whilst enjoying the sea during their cruise experience. She will sail in the Mediterranean for her inaugural summer season and in South America for the winter season, hence further strengthening the Company’s position in two markets in which MSC Cruises is the leading cruise brand. During today’s delivery ceremony, which pays tribute to an important maritime tradition, Roberto Olivari, Fincantieri's shipyard director, handed over to Pier Paolo Scala, Master of MSC Seaview, an ampoule holding the first water that touched the hull when the ship was floated out last year. MSC Seaview is the second ship in the Seaside Class and just like her sister ship MSC Seaside, is pushing the boundaries of pioneering ship building and design. MSC Seaview will be one of the more innovative ships at sea, also when it comes to the environmental technology that she will feature. In fact, not only will she comply with the highest international standards with this respect but will also receive – in addition to the main Class notations – its “Green Star 3 Design” notation from international classification society RINA in recognition of the attention that was paid to these aspects during the design and construction of the ship. RINA’s Green Star 3 – the latest and most comprehensive edition of the RINA’s Green STAR additional class notations – specifically recognises that MSC Seaview reaches the greatest levels of eco-compatibility thanks to the relevance of the various innovative measures put in place which help reduce the environmental footprint during operations. These include, amongst others, the exhaust gas cleaning system, the advanced waste water treatment, systems for the prevention of oil discharge from machinery spaces, the ballast water treatment system, and the ship’s Environmental Management Plan. 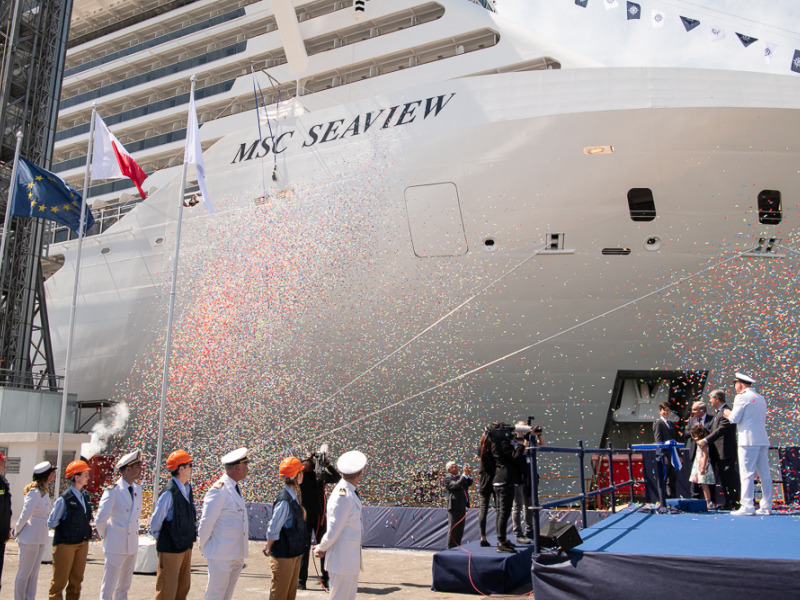 MSC Seaview is the third ship to be built under MSC Cruises’ EUR 10.5 billion investment plan which already saw the completion of MSC Seaside and MSC Meraviglia in November and May 2017 respectively. She will depart from the shipyard later today, making a three-day voyage, arriving in Genoa, Italy, her home port on 7 June. The newest addition to the MSC Cruises’ fleet will be officially inaugurated there in a glittering ceremony on 9 June and will commence her inaugural cruise on 10 June.